Next on the agenda? Veggie curry. If you didn’t get the beans out in time, and you don’t have a microwave: About 1/2 to 3/4 of an hour before you need them in a recipe, sit the container you froze them in, in a larger container of lukewarm water. This will help them thaw faster. Check from time to time. When they can be broken apart, they can be added to the recipe. This method also works for the rice; to reheat the rest of the way, add a tablespoon or so of water, and heat over low heat on the stovetop, in a non-stick pan. Or use a little oil and some diced celery, onion and mushrooms, and make it fried rice. To make today’s veggie curry we started by baking a butternut squash. You cut the squash in half, and scoop out the seeds. Turn cut-side-down on a piece of parchment, on a cookie sheet. Bake half an hour (depending on the size, you may need ten more minutes) in a 400F oven. When you can pierce with a fork, it’s ready. Let it cool a bit so you can handle it. Meanwhile, cook an onion, a stalk of celery, a chopped bell pepper, a couple of sliced carrots, and some mushrooms in a medium-sized pan. 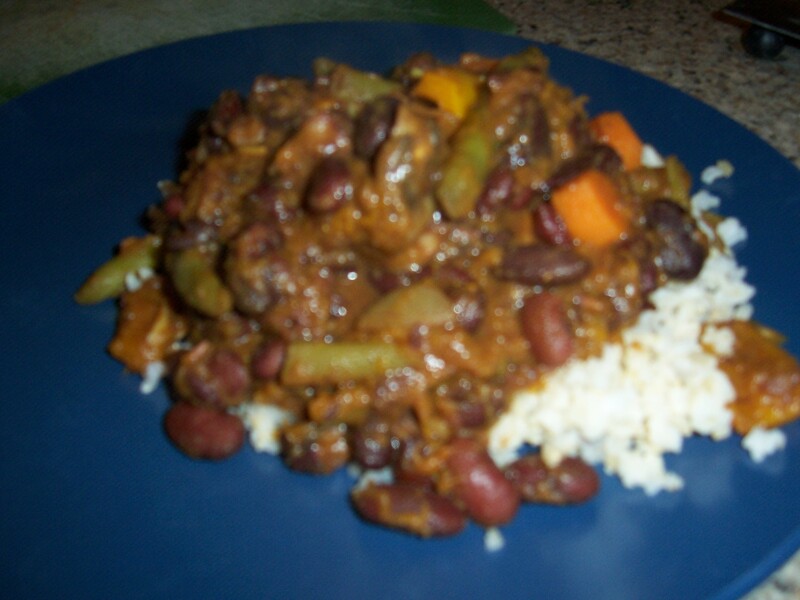 Add a couple of cups of cooked kidney beans (check out our bean recipe in the recipe pages). De-glaze with a splash of wine. Pour in a bit of broth (not too much, maybe half a cup). Scoop in half of the squash and save the rest for a delicious soup…within a couple of days, or freeze for later. Two tablespoons of curry paste are great for our hardy lot…but do it to taste. Use curry powder if you prefer. Or some garam masala, turmeric, and chili powder. Throw in a few green beans or asparagus – whatever’s handy and in season. Let it simmer until it thickens. Serve with the rice. Your tummy will thank you. Wedding days are full of promise…and we had fun watching the promises being exchanged between the Duke and Duchess of Cambridge this morning. 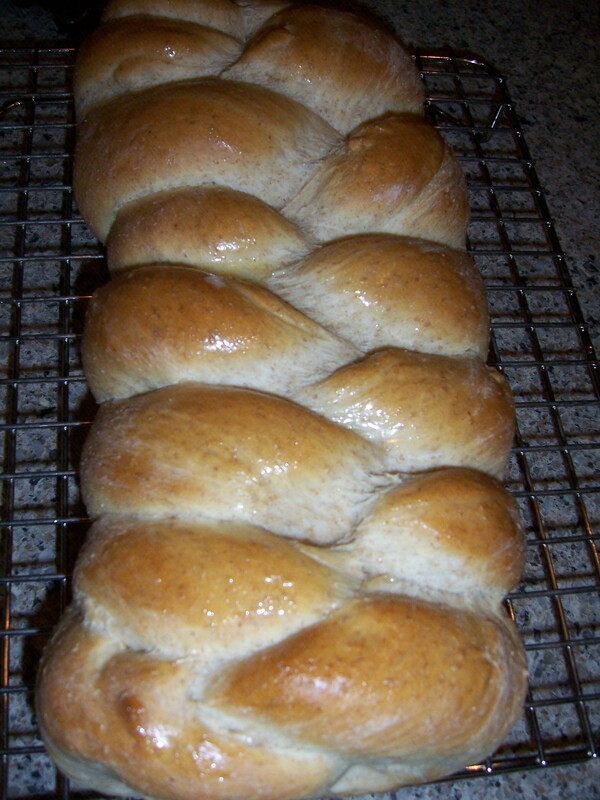 In honour of the intertwining of two lives, our bread this week is braided whole wheat (wholesome, with some fibre for the tough times, but a little sweetness, too). And what better than a bottle of something (cheap or expensive, no matter, but sourced by walking to our local liquor store). 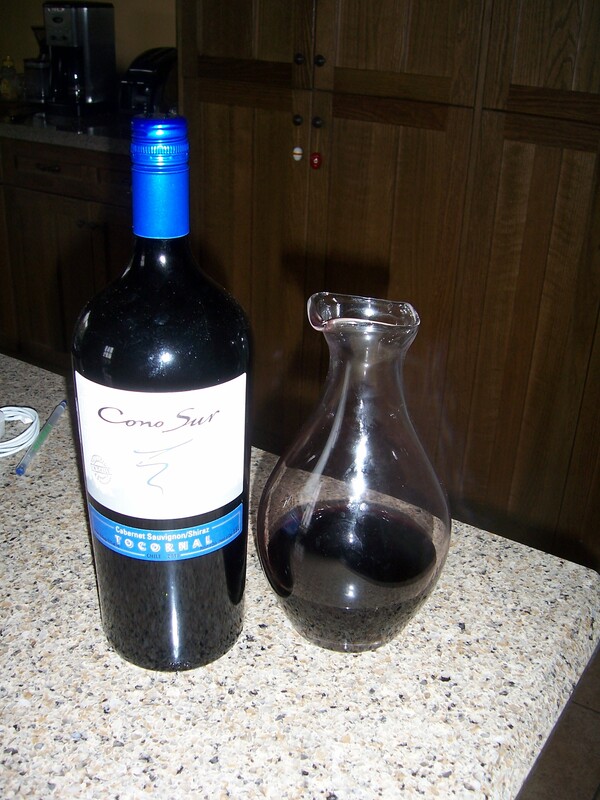 A loaf of bread, a jug of wine…and thou. Wishing a lifetime of happiness to the Cambridges. Sometimes in a busy household a change of plans can make the day’s meal plan impractical. Or fresh foods can spoil a little faster than anticipated. In our case, some spinach that ended up not being used on Sunday, became the basis for dinner on Monday. 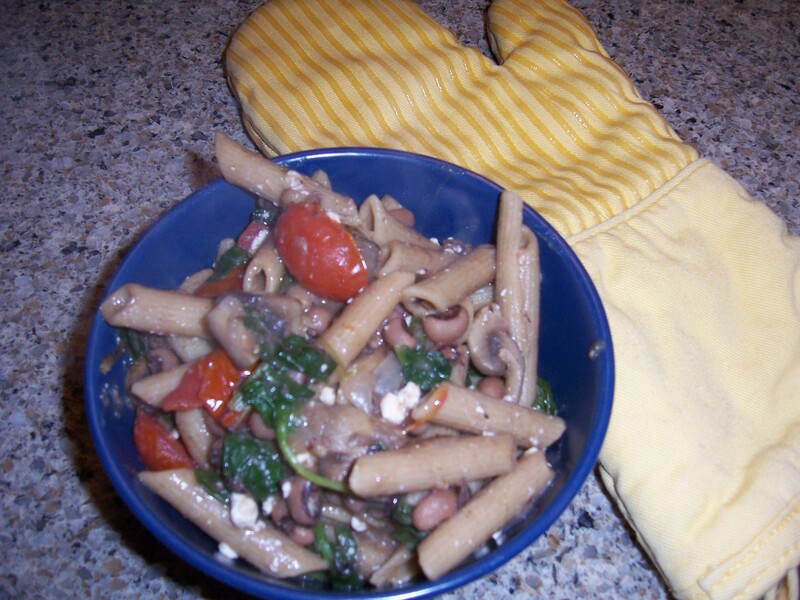 It was one of our usual go-to meals: some vegetables and beans (or cheese) tossed together with a whole-grain pasta. In this case, some spelt penne was the pasta star. 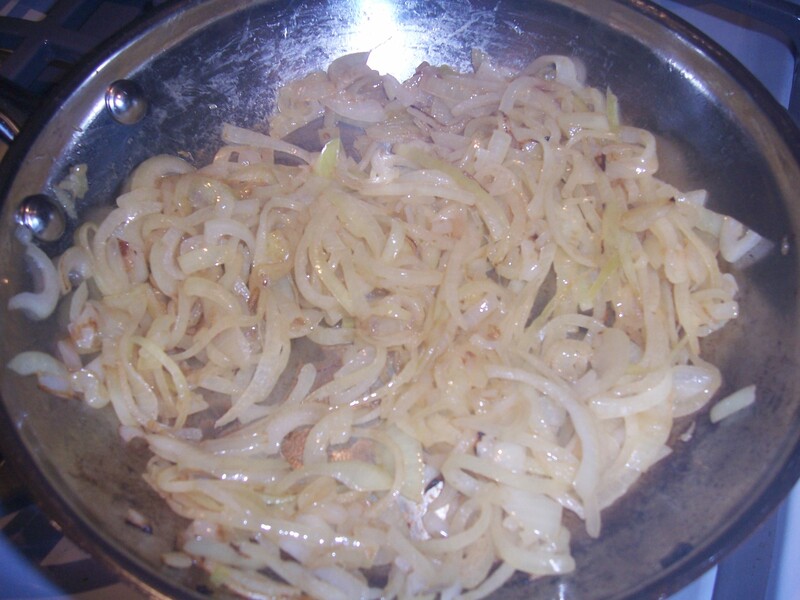 While it cooked we sauteed an onion, and added half a dozen mushrooms. 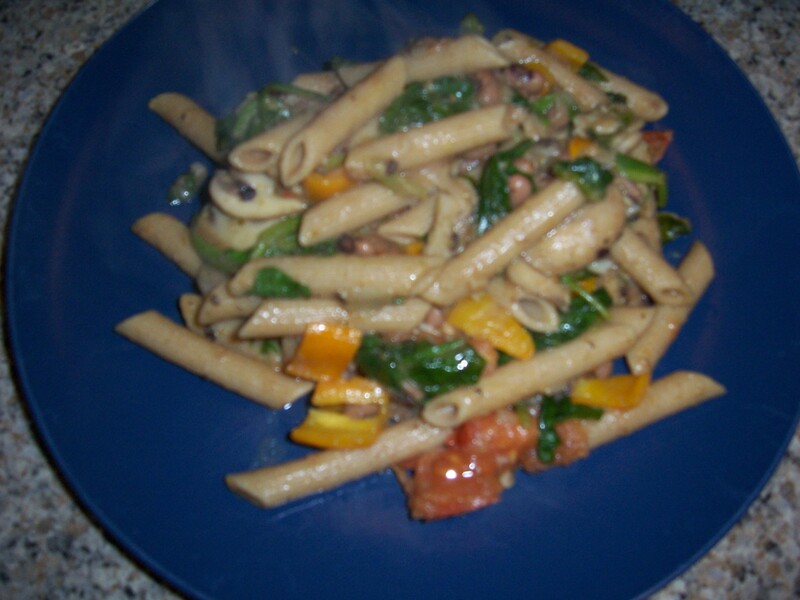 A splash of red wine, a packet of baby tomatoes, and the spinach in question came next, followed by a couple of cups of cooked beans. This simmered over low heat until the pasta was done. Then we tossed everything together and covered it, on low heat, for 4-5 minutes just to let the flavours come together. Finally, a sprinkling of feta for a salty-sharp accent. A casual, comforting end to a long day. 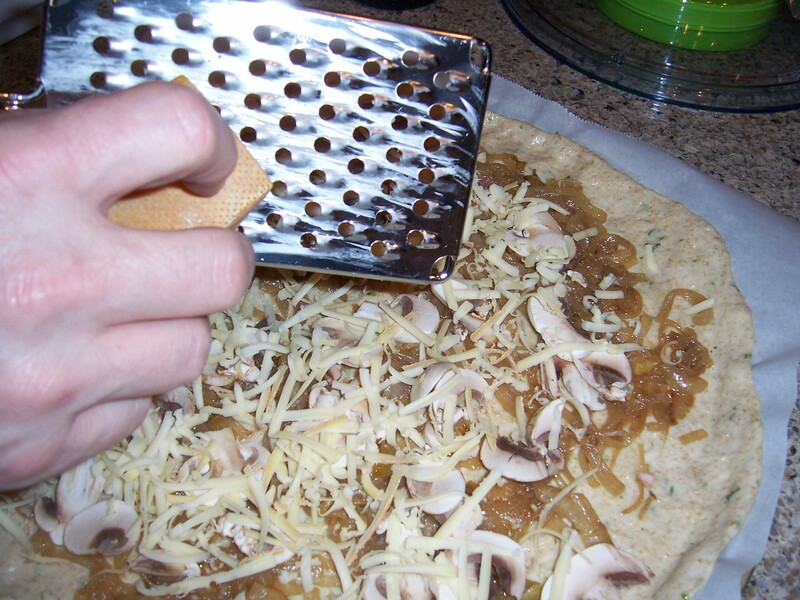 For our Caramelized Onion and Mushroom Pizza, we started with the same basic crust as the Delicious Artichoke Pizza, but we put some chopped fresh tarragon in the dough. 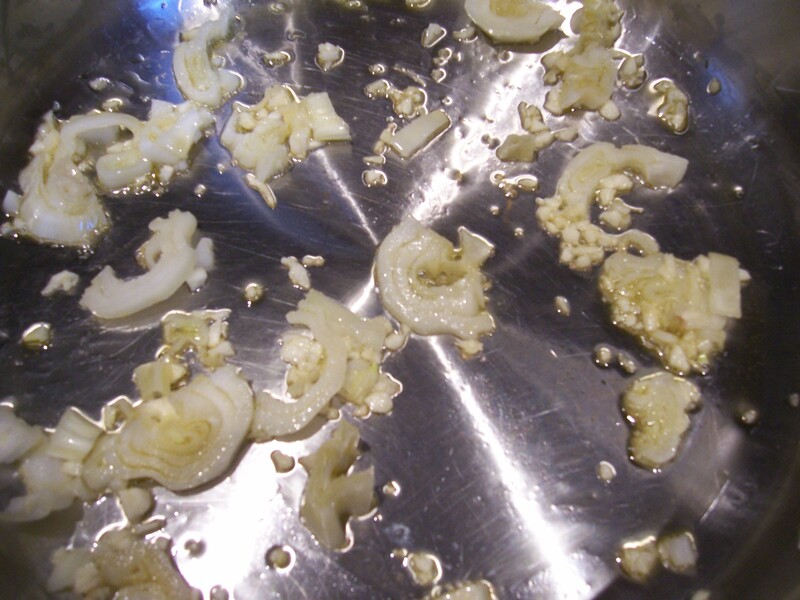 Meanwhile, we were caramzelizing the onions…two onions, thinly sliced, and about a tablespoon (15ml) each of butter a nd olive oil. Yes, it’s an indulgence…but well worth it. We also added about 5ml of maple syrup to add an extra flavour note. 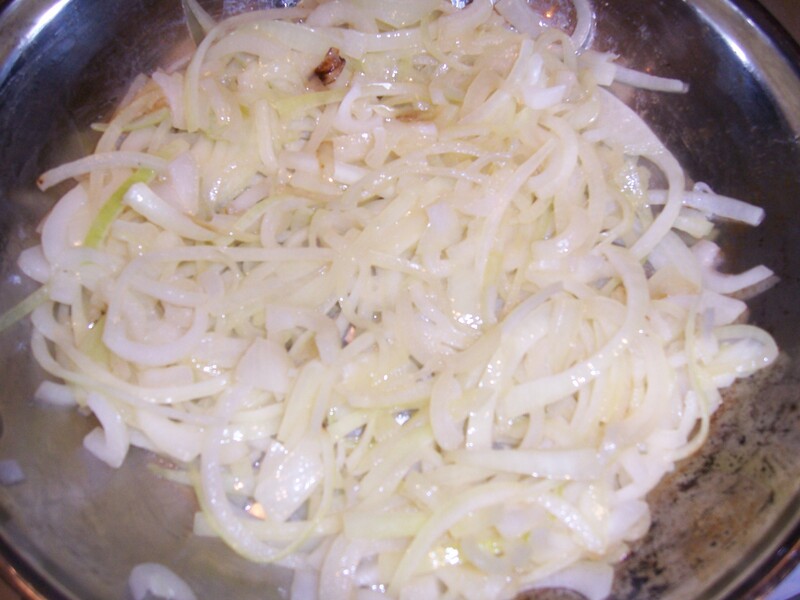 Cook the onions over medium-low to medium heat, stirring often, as they turn a delicious golden brown. When they look not quite brown enough, stop…they’ll continue to cook a bit. When you’re nearly at the end, add a tablespoon or so of white wine vinegar (balsamic would work also), and about a quarter cup (60ml) of water. Stir, cover, and let this stand and cool until your dough is doubled in size (about 10 minutes). 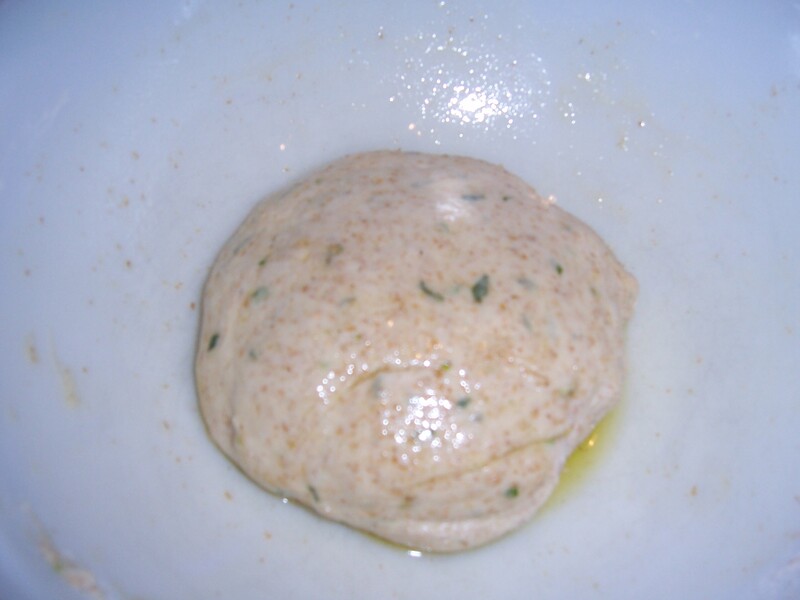 Next, press the dough out into a circle on a piece of parchment. This makes a medium-thin crust on a standard pizza pan. 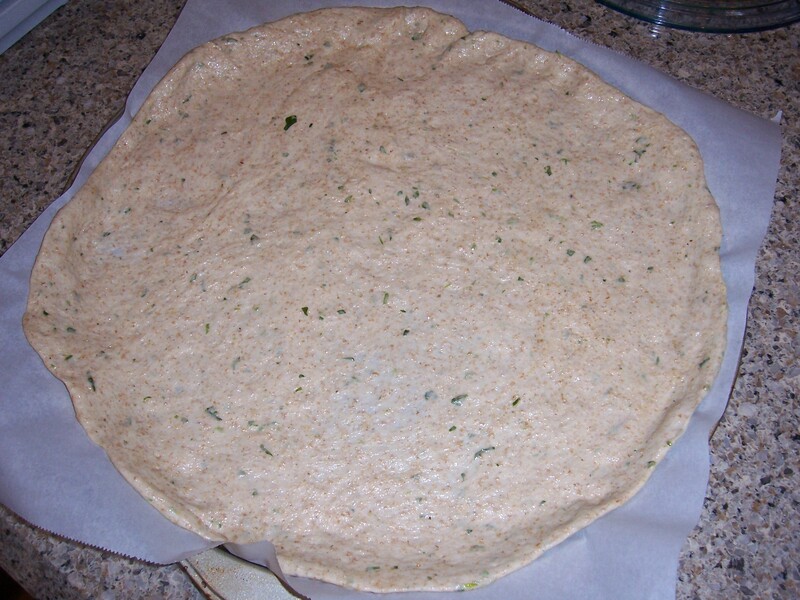 Divide in two if you like extra-thin, or use a smaller circle if you want a thick crust. Use the onions instead of sauce. 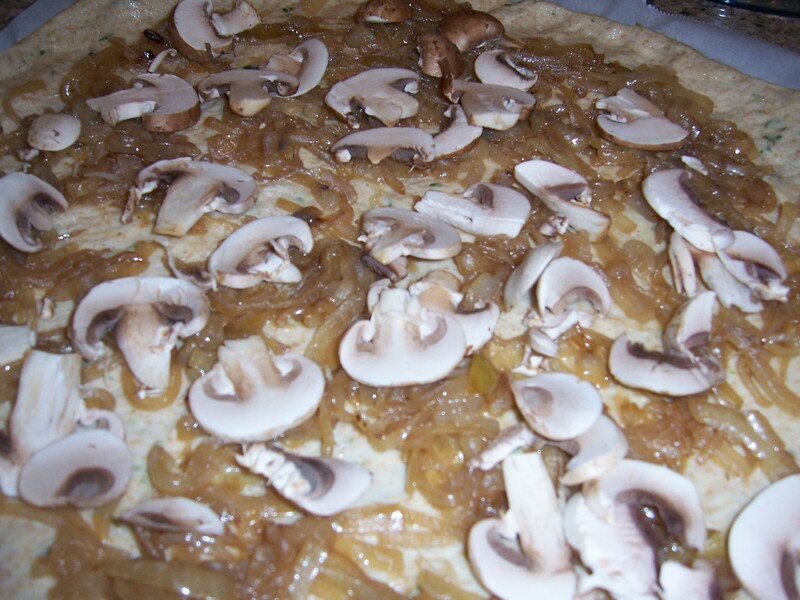 Top with sliced mushrooms – we used a mix of cremini (brown) and white (button) mushrooms, but any kind you like will work. We topped this with some nutty gruyere and a bit of part-skim mozza. At 400F, the pizza doesn’t take long – about 18 minutes. Then cool on a board for about 4 minutes, slice, and indulge yourself in onion-y goodness. Author WalkEatLivePosted on April 25, 2011 Categories Cooking, Recipes, VegetarianTags caramelized onion, cooking, food, fresh, Home cooking, maple syrup, mushroom, neighbourhood, pizza, recipesLeave a comment on More Pizza, Please! 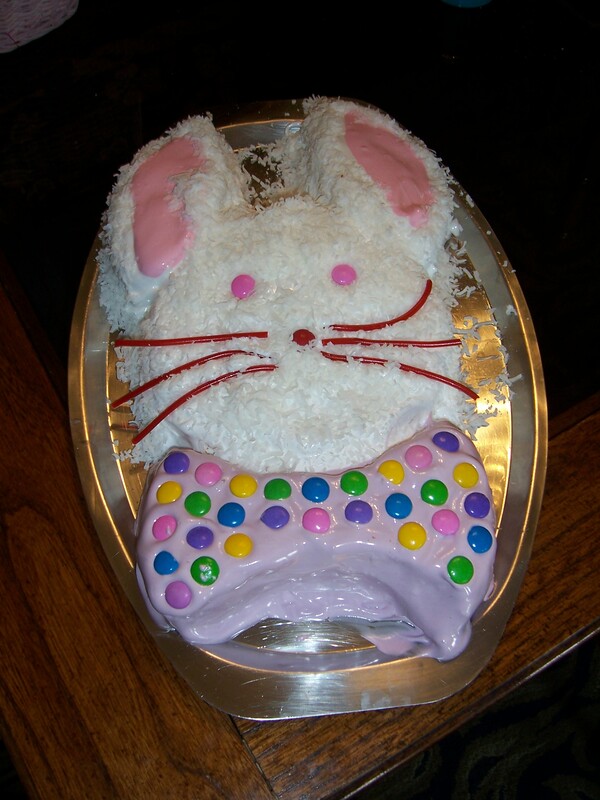 For our family, it wouldn’t be Easter dinner if there weren’t a bunny cake. Long after kids aren’t really kids any more, they aren’t willing to dispense with this cake, in all its ’50’s style glory. It starts as two round cakes (8 or 9 inches in diameter). 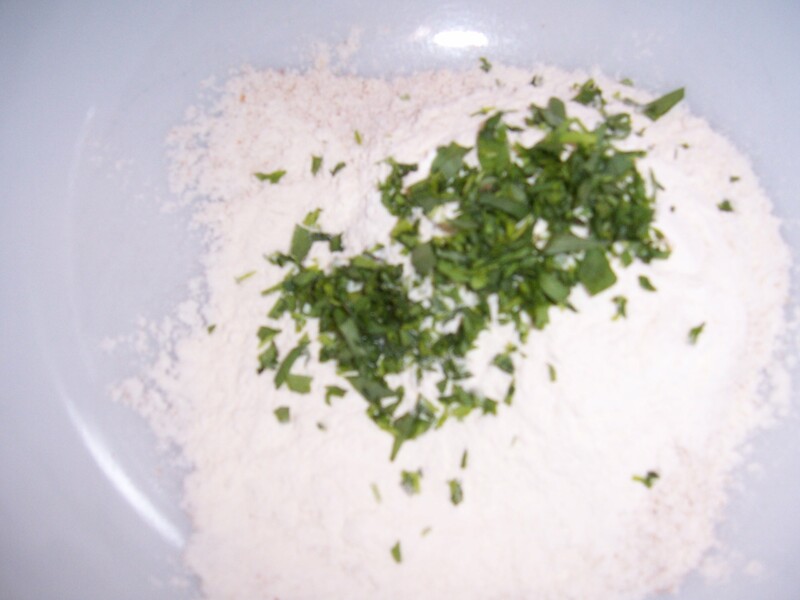 Make a carrot cake (traditional) or use a mix – any flavour will do. One cake is cut into sections, with two ears, leaving the centre of the circle to make the bow tie. The whole thing is iced with Italian Meringue Frosting, tinted appropriately. Each year there’s an argument about whether the bow tie should be pink, or mauve, or green, or yellow. Mauve or pink are easiest, since the pink frosting for the ears can be prepared, and then a little blue food colouring added as necessary. The candies are Smarties(TM) but other small round candies such as M&Ms (TM) would work as well. The whiskers are made of shoelace-style red licorice. The fur is coconut, preferably the long-shredded variety. 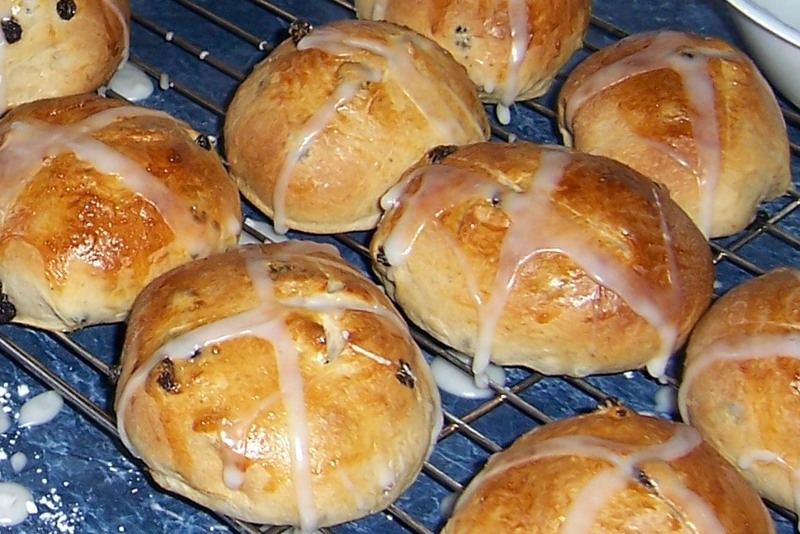 Some say it is traditional to eat Hot Cross Buns on Good Friday, but in our family they have been Easter breakfast for as long as we can remember. The cross traditionally symbolizes the crucifiction, and they serve as a reminder to us that Easter is not all about bunnies and candy (although we indulge in our share of those, as well). For some folks, Good Friday is just another day off work. But for us, it’s a busy day, filled with opportunities to come together with our community at St. Brigid’s. Fortunately fresh ingredients are easy to find in our neighbourhood. Red peppers, cucumbers, and lettuce from Ontario hothouses are available at Kelly’s, or Plank Road, or Jerry’s Supermarket now. We had the salmon in our freezer, but we can usually get a great selection of fish at the supermarkets on our walking route, like Sobey’s or Valu-Mart. This dinner starts with boiling the potatoes. While they’re cooking, we’ll bring the water up to a boil for the salmon, and then turn it down to a low simmer, flavouring it with a little citrus pepper and a few slices of lemon. (On another day, white wine would also work nicely). 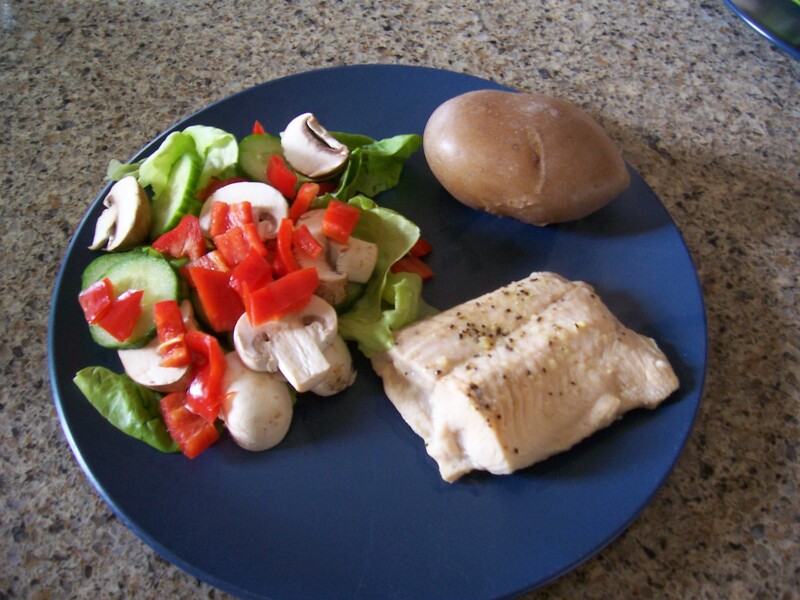 Then we’ll pop in the fish and keep it just gently simmering along while we make the salad. All that’s left is to give thanks for good food and the latest steps in our Lenten journey, and eat. Then, while the past cooks…start a little onion (one small one) and garlic (two cloves) in a couple of teaspoons (10ml) of chili oil. 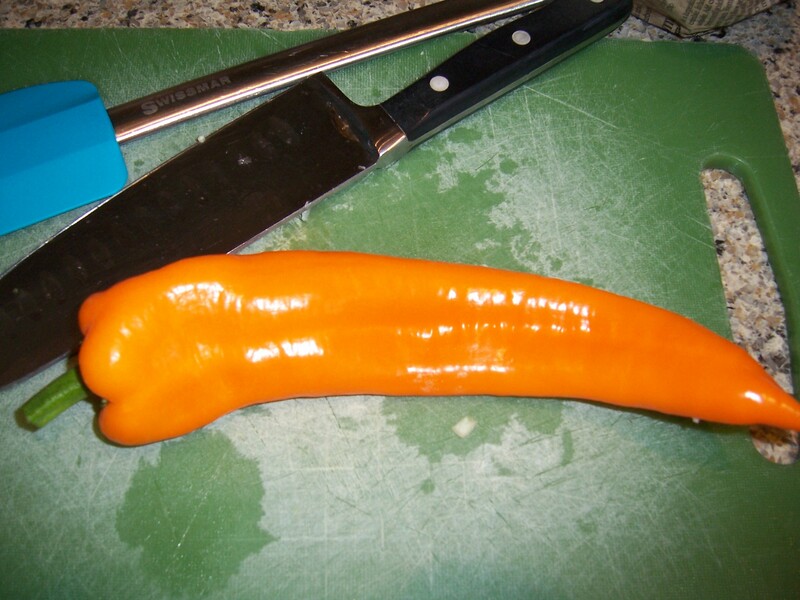 We also chopped in a sweet, sweet pepper we picked up at Plank Road, around the corner. Next, some sliced mushrooms for texture, just rinsed and sliced. Keep stirring as you add the veg. 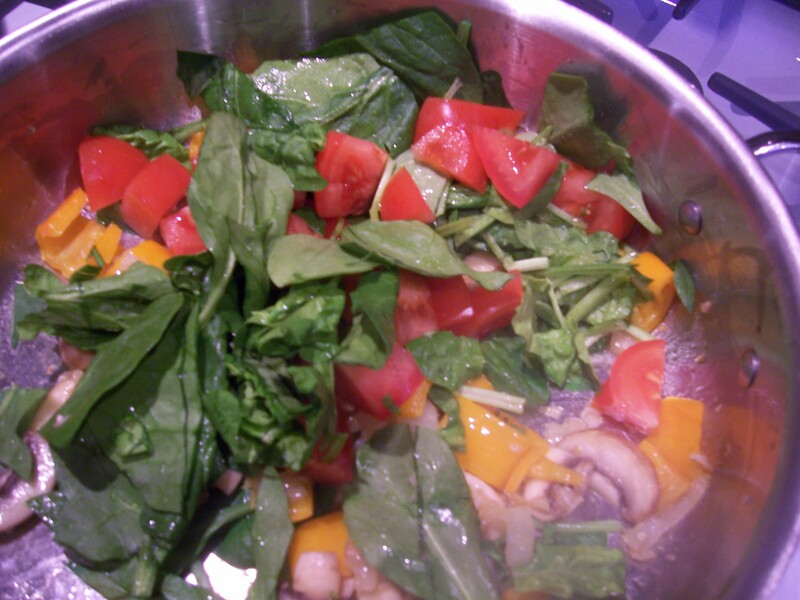 After the pepper, a good big handful of spinach, washed and chopped, and a diced fresh tomato go in the pot. Put the lid on, and turn heat to low for about 5 minutes to wilt the spinach. Finally, it’s time for the beans. Dump them into the pan, along with about a tablespoon (15 ml) of pesto (check the types and buy the one with the least sodium!) . Pop the lid back on and simmer all of this until it is bubbling hot and ready to receive the pasta – just a few minutes should do. Then tip in the pasta, stir, sprinkle with a little cayenne, and lid the pan again. Let it simmer over very low heat for the flavours to meld. Finally, when the flavours have had a chance to come together, serve! If you want, shave a little sharp cheddar on top, but you won’t need too much. An ounce or so should do between the two plates (that’s about 30 grams). Happy eating! 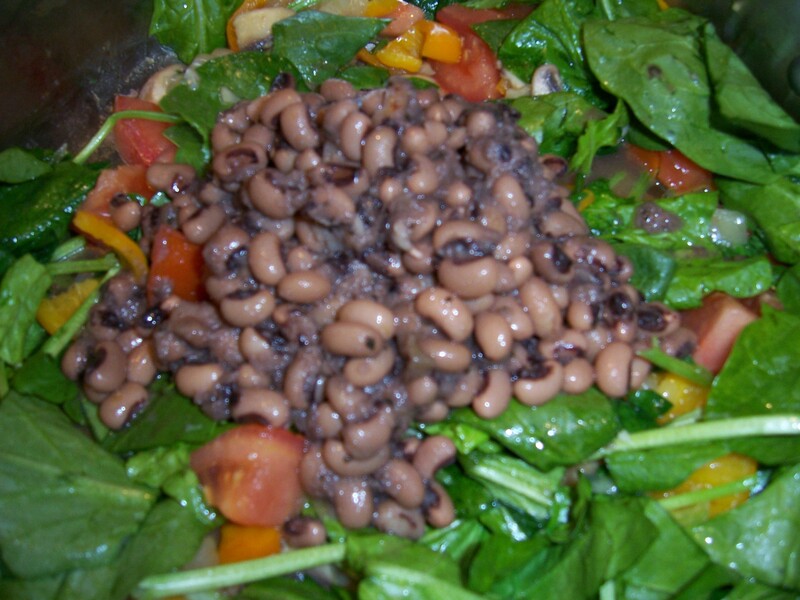 Author WalkEatLivePosted on April 16, 2011 Categories Cooking, Healthy Eating, Recipes, Uncategorized, Vegetarian, Weight LossTags beans, black-eyed peas, cooking, food, Home cooking, local food, menu planning, recipes, vegetables, vegetarianLeave a comment on Magic Beans! 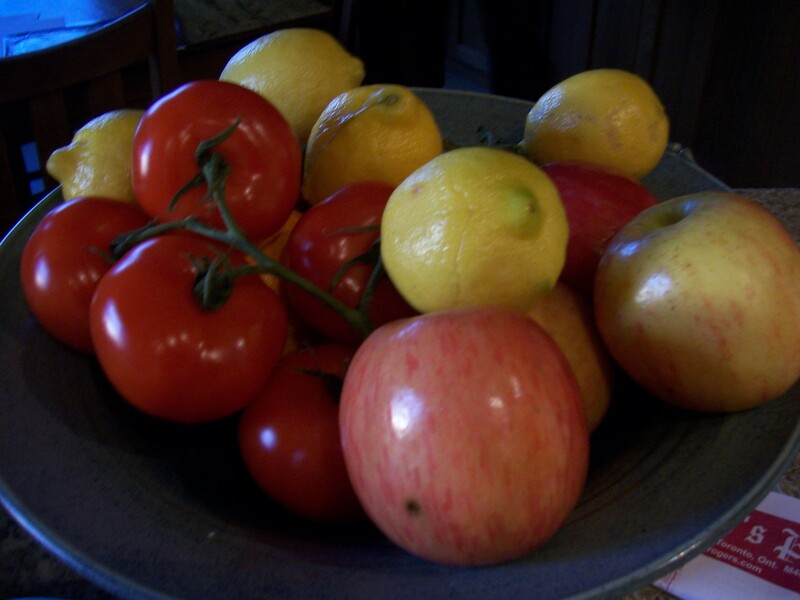 One secret to success are fresh fruits and vegetables when you’re trying to lose weight and keep in shape. If you combine that with a desire to eat local, and you live in a climate where those things don’t grow all year round, it’s a challenge. We like local. We like farmer’s markets. But let’s face it, some things just don’t grow around here at the best of times. So unlike some locavores, we’re not giving up lemons, or oranges, or coffee, because they come from somewhere else. Our compromise? We compare the ones that are available within a reasonable walk from our house (for us, that’s probably about 30 minutes each way), and buy the ones that come from the closest locale. What we get in return is an opportunity to get to know our local shopkeepers, still have a variety of foods, and to offset our carbon footprint by using…well…our feet! So the chops are marinated and the grill is ready. While they’re cooking, a salad is definitely in order. 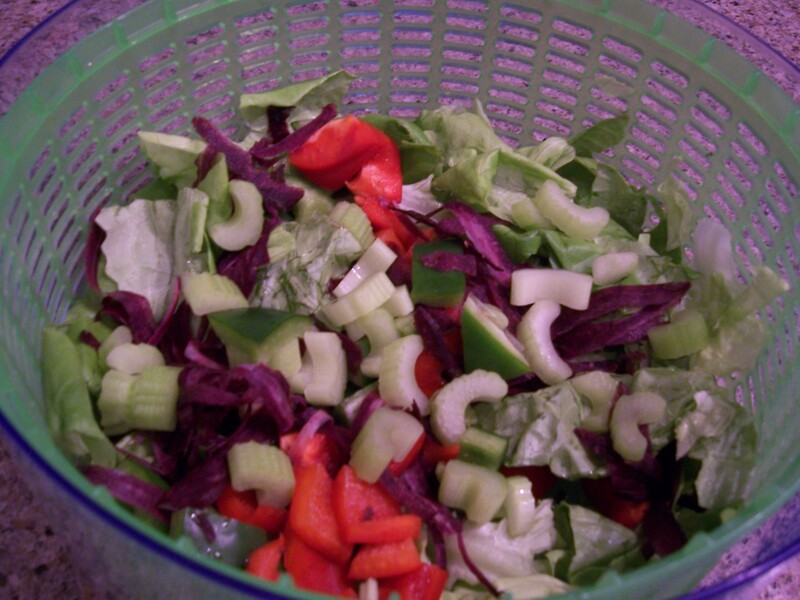 This one has some red and green bell peppers (greenhouse grown, here in Canada), butter lettuce (same) and celery. The purple is a gorgeous shaved artisanal carrot. All of this will be topped with a Dijon vinaigrette. 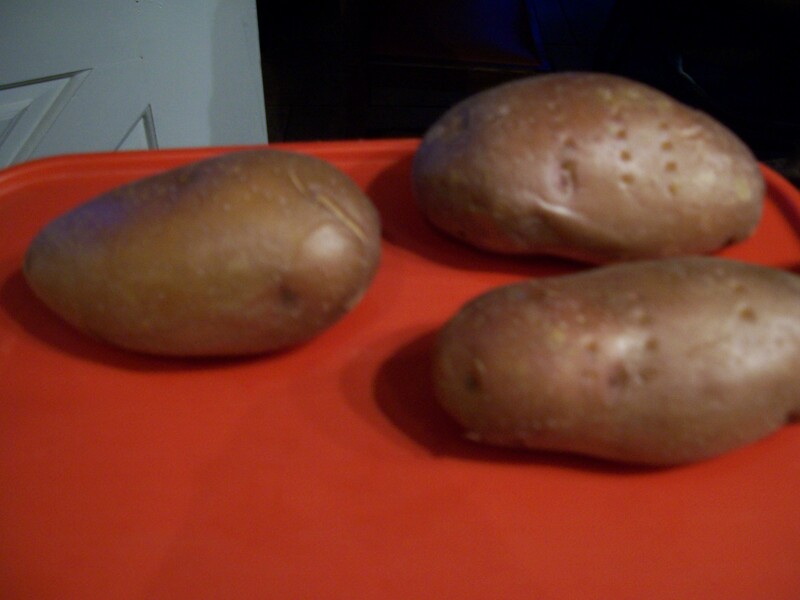 At the same time, I pre-started some red potatoes in the microwave. This is an easy way to get a consistently cooked potato on the barbecue, without using a lot of fuel to do it. These delicious red-skinned ones are awesome! 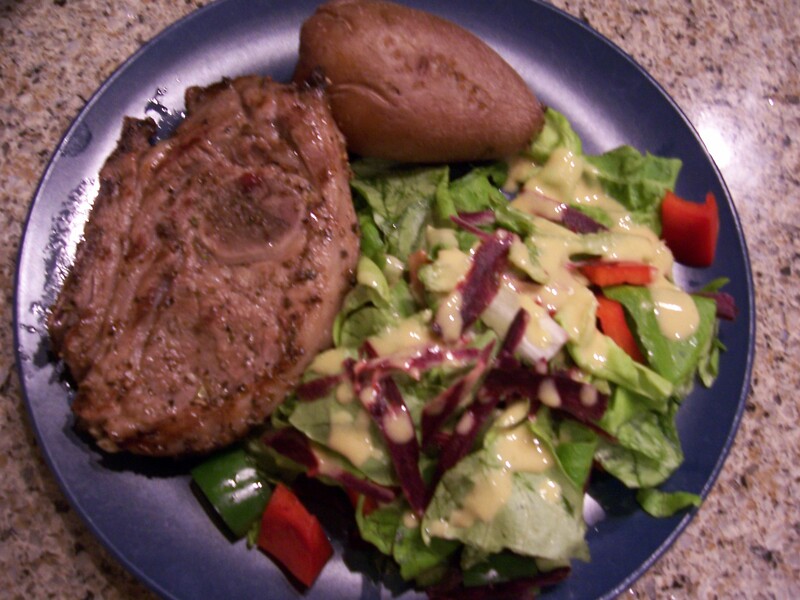 Then, pop the potatoes on the grill with the chops and dress the salad. Even though the temperature has dropped and spring feels barely here, we’re getting a real taste of summer with tonight’s dinner. One of the great things about menu planning is not having to worry about whether you’ll have the ingredients to pull a meal together. It’s also easier on the budget to not make impulse purchases. But we’ve also learned that sometimes we have to be willing to turn great ingredients into something different, or switch up a day’s dinner for another one – which is what we did when the need for a spring-like dinner hit!